I had a busy long weekend. 3 games of golf (Glen Cedars, Dentonia, Tangle Creek), over 8 hours in the garden (rebuilt the side of the pond, edged the front yard flower beds, laid down some mulch, trimmed and pruned the shrubs, and cut the grass). I also finished decoding the family tree that was given to us while in Sonneberg in May. The tree includes the occupations of my ancestors. There were (going back from my grandfather): 2 businessmen (kaufmann), 4 carpenters (zimmermann or schreiner), 1 workman (handarbeiter), 1 Hat makers (putzmachein), 4 tailors (schneidermeister) , 2 nail makers (nagelschmied), 1 dyer (rußbrenner) and 1 butcher (Metzger). My grandfather worked for SS Kresge. He started with them in Missouri sometime after his immigration to the US in 1913. According to his draft registration card, in 1917 he was a floorman in a department store. I don't really know what a floorman did; any current definition  seems inconsistent with what I remember of my grandfather. I'll look for the other [earlier] 122 discs. During my search, I have found a number of things. I'm getting ready to figure out how to organize all this stuff and then assess what is missing so I can undertake a more structured approach and possibly lay the ground work for our trip to Germany next May. I did come across a couple of interesting finds. First, was my grandfather's draft registration card, dated June 5, 1917. Next was the passenger list of the SS Pennland that sailed from South Hampton on the 23rd of April, 1939. Included on the list are my mother and grandmother (lines 4&5: Gruenwald). 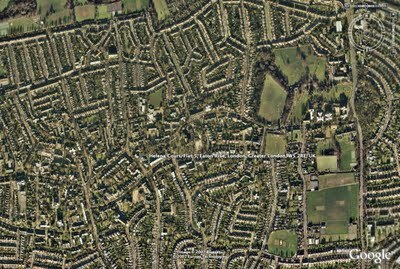 A search with Google Earth places them in Greater London. 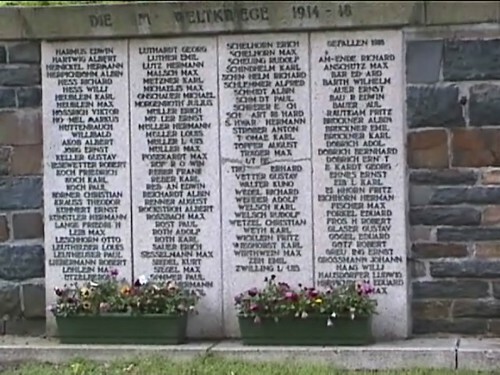 Last, at least for this post, I was looking through the Deutsche Kriegsgräberstätten web site (German War Graves) as when we last visited Sonneberg I noted that a Max Hertha was recorded on a First World War Memorial. I was able to find references to 15 Herthas, but none was a Max and none of them from Sonneberg (although many of the records did not include a birth place). Almost two years ago I participated in a genographic survey [1, 2]. The survey, conducted by the National Geographic Society and IBM, involved the use of DNA testing. The focus was not on the individual but rather large-scale migration patterns out of Africa some 50 to 100 thousand years ago. This data placed my ancestors in the Turingia/Saxony area of Germany about 5 to 10 thousand years ago. What is interesting about this is that these ancestors arrived there so long ago and remained there. So, what happened between then and now? To fill that gap requires tracing backwards in time from what I know today. Not that I expect to go back 5 thousand years. I'm lucky in that I have a good starting point. I've known my grandparents on both sides of my family and many of their siblings. I've been to my father's home town and found information there. I have my grandmother's collection that includes some documents and photographs she kept. But what initiated this round of investigation was my Dad arriving at Christmas with a stack of photo albums. From those I digitized nearly 200 pictures, for the most part, taken between about 1908 and 1960. I have spent the last week scouring the web for information. The investigation started off with a search on the term genealogy. With that I came across a number of sites, some summarized below. These sites have offered a lot of data: dates, places, events. But gaps remain. For these I will likely have to undertake a physical search for records. That phase I will plan out and then execute during our planned trip to Germany next May. Beyond the base data there are other contextual data to find. What did my ancestors do? This will require a different approach requiring a different plan yet to be formulated. 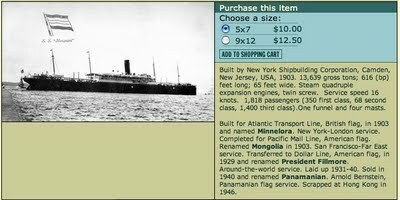 This site includes the passenger list of all or most ships arriving in New York between 1892 and 1924. Here I found the entry dates for my paternal grandfather, grandmother, my maternal grandmother and various great aunts and uncles. To date I have not found my maternal grandfather although I think I have found 3 of his brothers and his parents. 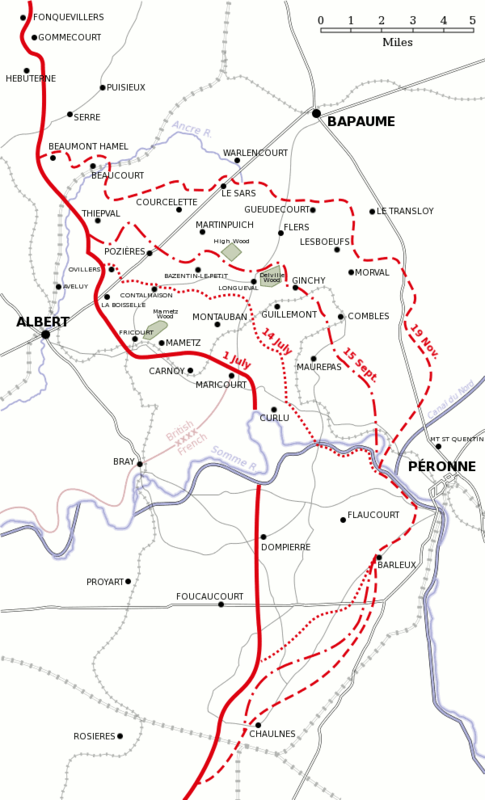 This site includes the entry records for those arriving between 1925 and 1935. Here I found the entry dates for my father, uncle and grandparents into Canada. This site includes the enlistment records for those joining the US Armed Forces between 1938 and 1945. Here I found my uncle's enlistment record. This site maintains a record of those who were killed in action, and where they are buried. This is where I found my uncle's information. This site can be seen as a portal providing access to both publicly (free) and privately (subscription) held information. Access to this site requires a subscription. In addition to providing access to the information above, it includes: census data, newspaper articles, birth certificates, marriage certificates, obituaries etc. As well it provides a networking capability allowing one to contact others doing the search. The major inhibitor is the lack of complete information. For example, obituaries are only available for certain states and/or over certain periods of time. Information outside the US is very scant. I will quickly find and consume what is relevant to me. My next steps are to consolidate and organize the information I have gathered. My Grandmother (on my mother's side) emigrated from Kaiserslautern, Germany and arrived in New York July 6, 1923. She was 18 years old. She arrived on the ship Mongolia that departed from Hamburg. The passenger list (see below, line 6) includes some of the basic information. I am glad to see that she was neither a polygamist nor an anarchist. All this information is available on the Ellis Island web site. I've been going through old pictures: scanning, tagging and posting them to my library. My Dad brought several albums on his recent visit from which I collected about 200 photographs. In organizing the pictures, I tag them by who (people), where (location), when (date) and what (event, such as a birthday). For older pictures, gathering all this data can be difficult and requires some detective work. The children are my Dad (standing) and my uncle (sitting); the adults are probably Edgar and Martha Hertha. So, first question is who are the two adults in the picture. The man seems to have a strong family resemblance. I know my grandfather had two brothers: Edgar and Rudolf. I know this because of the death notice of my great grandfather: My Dad said Edgar lived in Hamburg (and worked for a shipping company) and from the death notice (albeit almost two years before) Rudolf isn't married and the couple in the picture seem to be. Hence it is likely Edgar, but if not, then Rudolf. If Edgar, then I know Martha's name from the tombstone of the Hertha plot in Sonneberg. The relationship is further confirmed by the light house in the background as well as the nautical-looking thing the people are hovering around. Can we get the exact time? Yes. 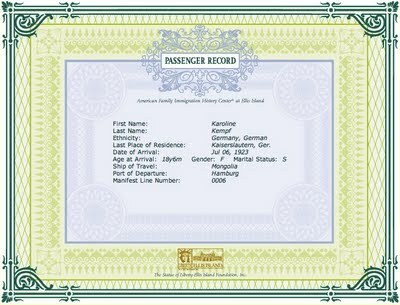 Passenger lists and immigration data are often on line. As I know they were coming to Canada, all I need to do is search the immigration data for the period between the late 20's and early 30's and see what comes up. What I find is that they arrived in Quebec on Sept 29, 1929. 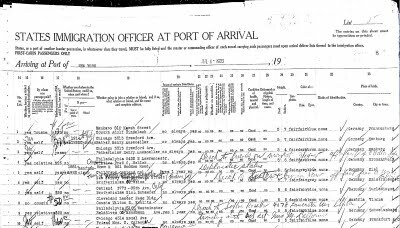 The crossing was typically about 10 to 14 days, but this I can confirm by checking the passenger lists for the SS Koln , which I will do later. But there's more. It is often interesting what some detective work will come up with. As I was looking for confirmation of the above picture I came across two other passenger lists, one from 1913 (Hamburg to New York) and another from 1922 (Bremen to New York), both including my Grandfather.